With over 1000+ conferences listed in its book of success, Conference Series has started off to add one more page of another marvellous scientific event. Conference Series is much delighted to invite you to mark your calendar on October 22-23, 2018 for the 3rd International Conference on Magnetism and Magnetic Materials that going to hit in Rome, Italy. Magnetic Materials 2018 is themed upon to Get Attracted to the World of Magnet by combining exemplary sessions, workshops/symposia, A2B/B2B meetings and exhibitor hosted sessions. The conference also aims to proclaim knowledge and share innovative ideas blending the professionals, industrialists and students basing on their research experiences related to the conference and to indulge in interactive discussions with other special sessions at the event. Magnetism is the feature of combined Electromagnetic force, aroused from the force produced by magnets. Due to the Lorentz Force, a magnetic field employs a force on elements in the field. The motion of electrically stimulated particles gives rise to magnetism. The force acting on an electrically charged particle in a magnetic field rests on the magnitude of the charge, the velocity of the particle, and the strength of the magnetic field. All materials experience magnetism, some more powerfully than others. Permanent magnets, made from constituents such as iron, experience the strongest effects, known as ferromagnetism. With rare exemption, this is the only form of magnetism strong enough to be felt by people. Electromagnetism is a division of physics which pacts with electricity and magnetism and the interface between them. Electromagnetism is principally the art of electromagnetic fields. An electromagnetic field is the field formed by matters that are charged electrically. In a certain range of frequency there are several electromagnetic fields viz. UV waves, X-rays, Infrared waves, Radio waves etc. Electricity is formed by the altering of magnetic field. The phenomenon is also called "Electromagnetic Induction." Likewise, the magnetic field is formed by motion of electric charges. Electromagnetism is genuinely applied in the use of motors. A motor has a switch that unceasingly switches the polarity of the exterior of the motor. An electromagnet is kept inside of the motor, but the current is operated in such a way that the external magnet repels it. Spin based electronics abbreviated as Spintronics, where the idea is to use the spin of the electron and, it’s charge. There are two directions in which electrons can spin- Spin-Up (clockwise) and Spin-Down (anti-clockwise), and the spin is noticeable as weak magnetic energy. Expectantly, with fewer effort more work can be done by Spintronics in compare with electronics. There are many probable practices of Spintronics. The most noticeable one is memory. MRAM is grounded on Spintronics, and it potentials to be a fast, small and non-volatile memory. In near future it can be observed that there might be transistors grounded on Spintronics, which will swap electronics circuit boards with Spintronics ones. Nanotechnology is the analysis of the behavior of materials on an atomic, molecular, and supramolecular level. In case of some materials, if the size scale of their dimensions reaches nanometers, their properties generally change, and that is the interesting fact about Nanotechnology. Technologists are trying to recognize those characteristic changes and apply them in the processing and making of substances at nanoscale level. Nanomaterials investigation opts for a materials science-based method to nanotechnology, inducing developments in materials metrology and fusion which have been advanced in backing of microfabrication investigation. Nanoscale level materials also have unique mechanical, optical and electronic characteristics. Magneto-electronics is an innovative knowledge used to accumulate, demonstrate and develop information grounded on variations brought about by magnetic fields in the electrical possessions of a material or material system. The magnetization arrangement can be prejudiced by exterior influences. It can be transformed into electrical signals by means of quantum-mechanical effects. Atomic-level dynamics comprises connections between electrons, phonons and magnetization. These relations are transferences of energy commonly labelled relaxation. Magnetization damping can arise over energy transmission (relaxation) from an electron's spin to: Itinerant electrons, Lattice vibrations, Spin waves, Magnons and Impurities. A hard magnetic material is also denoted to as permanent magnets, which retains their magnetism when detached from a magnetic field. Permanent magnets are prepared of substances like magnetite, the most magnetic arising mineral, or neodymium, a powerfully magnetic synthetic substance. The Earth itself is a giant permanent magnet, though its magnetic field is comparatively feeble in relation with its size. For example, humans have utilized the magnetic field of the Earth for navigation. Hard magnetic materials are generally applied in permanent magnets and data storage. Soft magnetic materials also referred to as electromagnets, which never retains their magnetism when detached from a magnetic field. These types of materials have low retentivity and low coercivity. But these materials have high initial permeability, large magnetic induction and low hysteresis loss. These can be effortlessly magnetized and demagnetized. Hence, these materials are termed as soft magnetic materials. Soft magnetic materials are commonly applied in power conversion and power adaption. Materials cast-off to create structural members of machineries and constructions that engage power loads. The defining parameters of structural materials are their mechanical possessions; in this they vary from other industrial materials such as optical, insulating, lubricating, paint-and-varnish, decorative, and abrasive. Among the chief superiority standards are the constraints of resistance to exterior loads, such as durability, toughness, reliability, and service life. Special Magnetic materials are those materials which are studied and used mainly for their magnetic properties. A special magnetic material's response to an applied magnetic field can be characterized into several distinctive types as has been mentioned as follows. At present, many technologies such as computer hard drives and security access cards rely on magnetic materials containing coded information. The magnetic material will have this information written onto it via electric induction, a process that requires a lot of energy. The use of a multiferroic material would allow the information to be written using an electric field, a process which would be more energy efficient. Superconductivity is a wonder, typically occurring at very low temperatures, in which some metals have zero electrical resistance and, as a result, very strong magnetic fields. Superconductivity has several real-world applications, such as Magnetic Resonance Imaging (MRI). Though, its hands-on applications have been restricted by the disbursement required to cool material to very low temperatures which have been essential to reach superconductive states. Superfluidity is the typical property of a fluid with zero viscosity which consequently streams deprived of loss of kinetic energy. When stimulated, superfluid forms cellular vortices that last to rotate open-endedly. The magnetic field that ranges from internal crust of the earth out into the space, encountering the solar wind, a torrent of charged elements originating from the sun, is termed as Earth’s magnetic field, also coined as Geomagnetic field. The Earth's magnetic field (or geomagnetic field) is an ever-changing wonder that impacts human action and the usual world in numerous ways. The geomagnetic field deviates from place to place, and on time gauges ranging from seconds to decades to eons. These variations can disturb health and safety, and financial well-being. The geomagnetic field, along with its related miracles, can both contribution and worsen navigation and gaging procedures; it can delay geophysical investigation; it can upset electric power services, and pipeline processes; and it can affect modern communications systems, spacecraft, and more. Magnetic Materials and their Applications confers the ideologies and perceptions behind magnetic materials and enlightens their claims in the arenas of physics and engineering. Magnetic materials form vivacious machineries in many categories of equipment from motors to computer systems. The technology is far away from stationary, and recent advances comprise microwave ferrites, magneto-optic recording and bubble memories. As you are looking to get up to speed on the latest developments in your field, Conference Series, the world’s largest gathering of professionals, industrialists and students is back again to hit with the 3rd International Conference on Magnetism and Magnetic Materials on October 22-23, 2018 in Rome, Italy. Magnetic Materials 2018 is a one-of-a-kind live experience that inspires creative professionals, leading industrialists, budding scientists and students to bring their ideas to life and shape the future of the industry. The conference is designed with the motto to Get Attracted to the World of Magnet. Get actionable intuitions from leading industrialists- Learn from the world’s top thinkers and doers in the arena of Magnetism and Magnetic Materials in a series of main stage talks over two days. Magnetic Materials 2018 speakers offer pragmatic, real-world insights that transcend creative sectors. Heighten your capabilities- Expert-hosted breakout sessions explore new ideas and methodologies around career, research, productivity, and more in the field of Magnetism and Magnetic Materials. Sharpen your skills- Hands-on workshops give you a chance to dive into new disciplines, trends, and technologies. Network and Unwind- From our pre-conference kickoff to our killer closing party, Magnetic Materials 2018 provides you with endless opportunities to network with fellow attendees and get exposed to new ideas. Magnetic Materials 2018 brings together numerous of people across a variety of practices and professions in this creative field who are working to: put an idea into action, get inspiration from creative leaders, connect with potential collaborators, manage an effective research group and workshop team, understand the trends affecting the future of creativity in this zone of Magnetism and Magnetic materials. Rome is home to many industries that are related to work in the field of Magnetism and Magnetic Materials which make us believe that Rome could be the place for the next meet. Alongside that fact Rome is an ancient city which stores history of European Civilization and the world itself. Perfectly said that Rome was not built in a day. It has seen many ups and downs and now it stands at such a great height that it attracts roamers from all around the globe. This colossal, Colosseum-stud city has a lot of attractions for its guests and Conference Series Ltd. is pleased to welcome you to the serenity of this European city. Advanced Technology and Materials Co. Ltd.
Beijing jingci Magnetism Technology Co.
Beijing Zhong Kean Huan Hi-Tech Co. Ltd.
BGRIMM Magnetic Materials and Technology Co. Ltd.
Hungarians Groups DMEGC Magnetic Co. Ltd.
Conference Series is welcoming you to the 3rd International Conference on Magnetism and Magnetic Materials for renovating and transferring your expertise and experience to inspire people and organizations with actionable ideas on October 22-23, 2018 in Rome, Italy. Magnetic Materials 2018 combines exemplary sessions, workshops/symposia, A2B/B2B meetings and exhibitor hosted sessions by blending the professionals, industrialists and researchers to Get Attracted to the World of Magnet. In 2016, the global market of magnetism and magnetic materials has reached $32.2 billion. The market has almost touched $34.9 billion in 2017 and as expectation it should reach $51.7 billion by 2022, growing at a compound annual growth rate (CAGR) of 8.2% from 2017 to 2022. These are the indication of the global market for magnetism and magnetic materials, along with their evolving technologies and budding business prospects in the future. 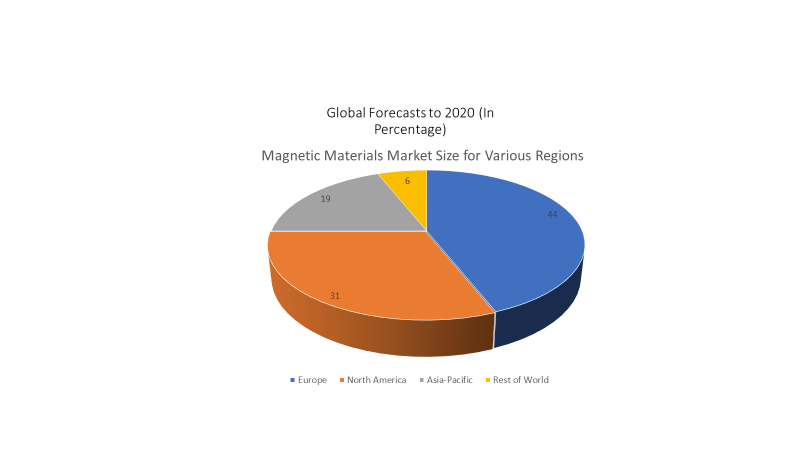 As per the report on global forecast to 2026, Soft Magnetic Materials Market by Material type, Application and End user industry is expected to reach $28.15 billion by 2021, increasing at a CAGR of 7.8% from 2016 to 2021. The cumulative claim for materials that can diminish eddy current loss and propose good permeability is driving the practice of soft magnetic materials in many end-user industries such as automotive, electronics and communications and electrical. And the global hard magnetic materials market is projected to increase from about $13.4 billion in 2015 to roughly about $20 billion by 2020, maintaining a CAGR of 8.4% for the time-span of 2015-2020. Now considering the global market for superconductivity technology, it can be estimated that from $3.4 billion in 2016 it should reach $5.3 billion by 2021 at a CAGR of 9.4% from 2016 to 2021. Intuition into the chief end-use markets viz. electronics and instrumentation and automotive, global industry analyze forecast till 2023, soft magnets market by its type, regions, competitive industries and applications. On the basis of types, the global magnetic material can be broadly segmented into soft magnetic material and hard or permanent magnet. In 2014, permanent magnet accounted for more than fifty percent of market share of the global magnetic materials market in terms of volume. On the basis of application, the global magnetic material market has largest applications in automotive, industrial and electronics segment. The automotive segment is projected to have the highest growth rate during the forecast period. Asia Pacific garnered the largest share in terms of consumption in the global market for magnetic materials and accounted for 79.0% of the global demand in 2012. The region has been significant in the magnetic materials industry on account of growing demand from manufacturing industries such as automotives and electronics. Europe was the second largest consumer of magnetic materials owing to various factors such as high demand from current and emerging applications, modernization and development of infrastructure. In addition, Asia Pacific is expected to witness the fastest growth over the forecast period on account of rising demand for magnetic materials such as permanent magnets in China, Korea, Japan and other countries due to growth of the wind power industry. We have successfully hosted the International Conference on Magnetism and Magnetic Materials on October 09-10, 2017 in London, UK. The conference focused on the theme “Enlightening the Future Scope of Magnetism and Magnetic Materials”. The conference was successful in gathering eminent speakers from various reputed organizations and their paramount talks enlightened the gathering. Magnetic Materials 2017 received generous response from the academia, talented researchers and young student community. Researchers and students who attended the event from different parts of the world made the conference one of the most successful events in 2017 from ours Organization. The conference was marked with the presence of Renowned Speakers, Young Researchers, Students and Business Delegates driving the two-day event into the path of success with thought provoking keynote and plenary presentations. We extend our heartiest thanks to all the Organizing Committee Members for their kind support rendered towards the success of Magnetic Materials 2017 conference. At the same time, we take the opportunity to thank all the speakers, delegates and participants for providing their valuable contribution and time for the conference. The Organizing Committee of Magnetic Materials 2017 would like to thank the Moderator of the conference, R K Pandey, Texas State University, USA who contributed a lot for the smooth functioning of this event. With the encouragement and enormous feedback from the participants and supporters of Magnetic Materials 2017, we are glad to announce the 3rd International Conference on Magnetism and Magnetic Materials that has marked its slot on October 22-23, 2018 and is ready to hit in Rome, Italy. Magnetic Materials 2018 is themed upon to Get Attracted to the World of Magnet by combining exemplary sessions, workshops/symposia, A2B/B2B meetings and exhibitor hosted sessions.